NOMADIC SPA specializes in mobile massages, body treatments, and spa parties delivered to your St John home or rental villa. We bring everything needed to transform your area into a tranquil day spa. Sit back, relax, we bring the spa to you. All of our services can be performed indoors or outside overlooking the Caribbean Ocean. 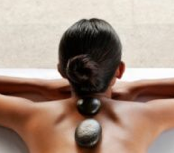 Smooth Balsalt Stones are heated to unlock tension deep within the muscles and facilitate total relaxation. Your stone massage is customized with hawaiian lomi lomi, reflexology and swedish techniques combined with Moroccan Oils. A massage to remember! one hour $140. hour and a half $180. Traditional swedish massage is transformed into the extraordinary with our Moroccan incense oils infused with sandalwood and vanilla. one hour $120. hour and a half $160. A great compliment to receptions, birthday parties, and receptions allowing a greater number of people to receive massages in 5 to 15 minute increments. *All of our services can be scheduled side by side for a great couples treat! Bella Lucce’s Chianti & Grape Seed Scrub, Mediterranean Wine & Honey Mask and a Bacchus Body Oil Massage. hour and a half $165. Renew and refresh tired skin as the sacred, sensual aromas of sandalwood and vanilla fill the air. 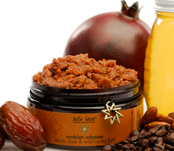 An array of ancient Arabian beauty secrets infuse the skin with a cocktail of powerful antioxidants (pomegranate oil, fig extract, and rich Turkish coffee) as sun-dried Moroccan lava clay masque pulls toxins from deep within the skin. Includes Bella Lucce’s Exotic Date & Wild Honey Buff, Spiced Pomegranate & Yogurt Detox, and a Moroccan Incense massage. A seven day detox program. Your therapist will treat you to a foaming sea scrub, sea mud mask, and body mask, fortifying hair mask, and skin renewing glee. Our therapists will leave you with instructions and a weeks worth of full size detox products for self pampering. All of your friends will want one. All of your friends will really want one. Delivery is free when purchased with a Massage or Spa Service. *All gift sets can be wrapped and personalized with a gift tag for and additional $10. *Gifts for groups of 6 more can be further customized, just ask. Let us plan a spa party for you and your group. Weddings, birthdays, anniversaries, or just because. Our spa party is the perfect way to treat yourself and your loved ones to the luxuries of a day spa in a party atmosphere. Spa parties are custom created to suit your occasion. Casey graduated from the Ashmead College of Massage in Seattle, Washington in 1998 and headed immediately to St John and sunnier weather. It was here he would meet his future wife, Sabrina, also a massage therapist. With 14 years of luxury spa experience between them, it was their desire to provide the same high quality resort spa services delivered to St John homes and rental villas. 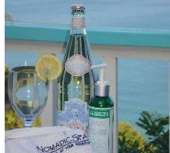 Nomadic Spa was launched in 2003, the same year they were married.